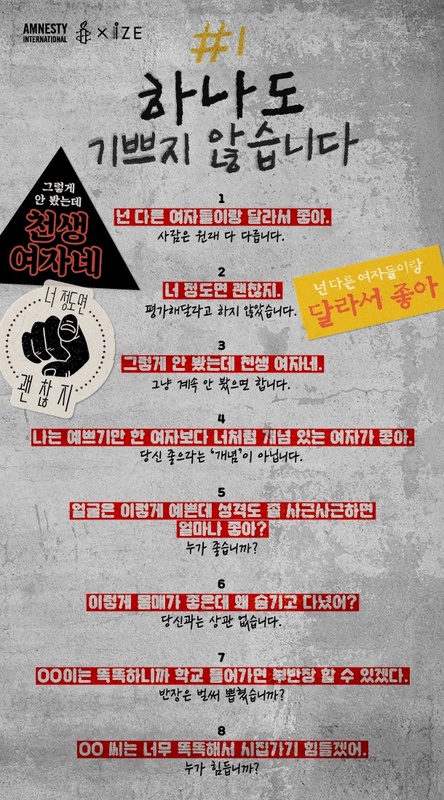 Amnesty International Korea has analyzed K-Drama’s many romantic relationships and come up with a list of things they believe are unacceptable. While K-Dramas are loved by people from all over the world, there have been concerns regarding the violent “romance” that is often depicted in several series. Scenes in K-Drama often include the male character forcefully grabbing a female character’s wrist and pulling her along with him, unexpectedly kissing her without prior consent, or loudly shouting at her. Amnesty International and IZE Magazine teamed up to create a movement that aims to educate people about what they feel are unacceptable violent romance scenes in some series. The movement also aims to discourage future dramas from including such scenes, as Amnesty and IZE feel they promote a skewed perception of love and relationships. 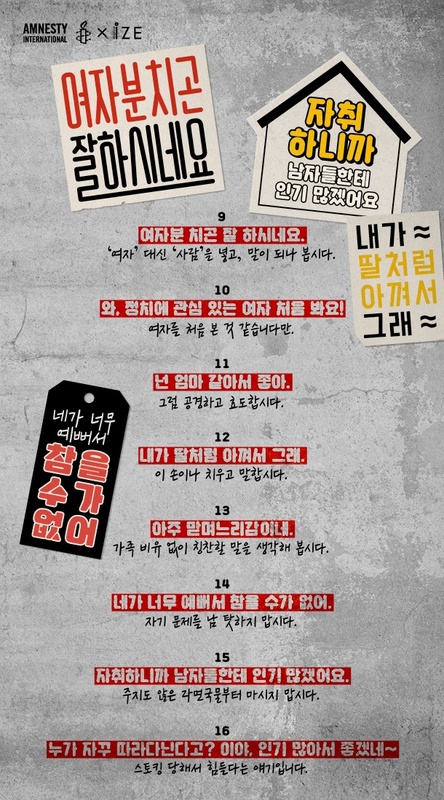 They created two hashtag movements: First, a list of unacceptable behavior exhibited by male characters in K-Dramas; second, a list of misogynistic phrases that are overly used in many drama series. #1 It doesn’t make me happy at all. All people are different in their own way. I never asked for your judgement. You don’t need to see me in any way. I didn’t tailor my personality to suit you. My body has nothing to do with you. Is class captain already taken? How about replacing ‘girl’ with ‘person’ and seeing how that works out. More like this is the first time you’ve met a girl. Then respect and be good to me. Then keep your hands off me. Try and come up with a compliment that doesn’t relate me to your family. Don’t blame someone else for your problem. Not now, and not then. We’re not flowers, we’re people. To block my ears with the money I earn so I don’t have to hear your words. All you have to do is respect me and not cross the line. Don’t pretend to be virtuous. You’re judging both my looks and my age. You don’t know what to say and what not to say, even at that age. #2 I’m not impressed anymore.